Loving the site so far. As I sat here writing down in my log Ace's latest meal, I started thinking that maybe there is an easier way to do this. I was on vacation last week visiting family and at a wedding and through the hustle and bustle here there and everywhere, I didn't really log anything for over a week. At work, we have transitioned a lot of information to Google (sheets, docs, forms, etc.) so I started thinking that this might be a perfect way to approach this in a way that is not only convenient, but stored and accessible everywhere. I've pulled up the log that Diane has and the epi4dogs log and put together a google form with a lot of that information. I've created a link on the homepage of my phone that takes me directly to that form. Do I always have my log handy? Nope. Do most people in today's society have their phone with them more often than not? Yup. Here's the LINK to it, if anyone wants to take a peek. Just don't go submitting your pooches meals to my spreadsheet! Hi all, I'm Bill. Ace was diagnosed with EPI on 5/31/18. In January, 2018 he was at the vet for routine check-up and weighed in at 34 lbs. In May after fighting with weeks of poor poo, he weighed 24.6 lbs. On Saturday July 28th, Ace was diagnosed as diabetic. Since then, we've been able to get back to a steady 31-32ish lbs with 1 tsp Enzymes per meal. He receives 1 Wonderlabs B12 3-4 days per week to maintain his levels which were off the chart high when they were just tested. We add 1/4 tsp slippery elm to each meal. He receives 6 units Vetsulin injections twice daily with each meal. Love you techy people !!! Looks very good and efficent. Its a great idea ! Me.. the none techy person.. I'll stick to my monthly log paper taped to the inside of my kitchen cupboard ! From there it goes into a 3 ring binder (yes.. they still make them !! . It drives my vet crazy if he asks too many questions ! I love this!!! How would I go about creating one for myself? I use Google Chrome - I'm being forced to become more tech savy these days. I would love this as I have not been keeping up with my log the past month. Madelon - So this is a quick and dirty "test" of the form I created. I hope you don't mind that I borrowed the banner at the top of the webpage for this. 1. Click on this LINK. A new tab should pop up asking if you would like to make a copy of Epi4Dogs log. If you have a google account, it will ask you to sign in or create an account. 2. Click on 'Make a Copy' and that page should open up the Google form of the log. Here you can make any adjustments, additions, or deletions as you see fit. 3. At the top of the form, you will see questions and responses. Click on Responses. Look for the little green symbol that signifies a Google Sheet. Click on that symbol to create a Google Sheet in your drive account. This is where all of your responses will be stored. Make sure that the name of the form and the name of the sheet match otherwise your responses will disappear and float through cyberspace. 4. At this point, you have edited the form to contain the information you want and have created the spreadsheet to match. IF everything goes to plan, you now have a form you can use to store information. If you scroll to the top right of the page, you should see what looks like an eyeball (or the CBS symbol ). Click on that to see a live view of how the form looks. Fill in, click submit and it should show up in the sheet you have in Drive. I use google sheets to keep up with my sales on eBay. I sadly did not set it up, my brother had to do it for me. I like the log that you have made. Great job, by the way Ace sure is a cutie! My name is Stacie and my girl's name is Dizzy. 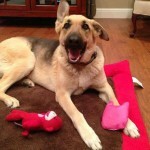 German Shepherd, Age 9-diagnosed 12/24/2011 at 55 pounds, current weight is 93 pounds. Feeding Taste of the Wild 4 cups a day with Enzyme Diane 1tsp per cup. Wonderlabs b12 once daily. Dizzy has Pannus, given Cyclosporine drops in each eye twice daily. Pepcid once daily. Apoquel for allergies once daily. OMG... this is a FANTASTIC way to keep track of a log, especially if you tend to be very "mobile"... would you mind if i included your idea on our EPI Log page?????????????????? Olesia, owned by Izzy, a 35lb Spanish Water Dog (SWD), Diagnosed at 1.5 years old - TLI results 1.3, Doing great 12+ years later! Once stable at 3+ months, was able to reduce enzymes to only 1/2 tsp of Enzymes (use EnzymeDiane's 6x) with each cup of food, but as she aged- -had to go back 1 tsp enzymes per cup of food. Fed various grain-free kibble+real meat, 6x pancreatin enzymes from EnzymeDiane., gave 1 tsp of coconut oil / fish oil daily .... until she developed Diabetes and she now cannot tolerate higher fat foods. Currently feed an 80% home-made diet of sweet potato, a lean meat/fish, 1/3 of a raw egg, fat free cottage cheese, fish oil+vitamins and bone meal with 20% Annamaet Lean & Grain Free kibble. This combo has regulated her Diabetes (takes Vetsulin) and EPI and is very well managed. In Feb 2013, Izzy developed a very serious condition called IMHA which she (thankfully) beat and is now in remission. This is when we discovered that she also developed Diabetes & Low Thyroid. Izzy was able to receive excellent care because of the generosity of folks on Epi4dogs! Izzy continues to wake up every day full of joy. I am not a vet. All of my suggestions/recommendations are based on personal experiences, observations, information gleaned from EPI researchers & pet parents alike, and EPI research. Please share with your vet everything we suggest. I absolutely don't mind at all. That's the reason I put one together with the Epi4Dogs banner. The nice thing about downloading the form I put together is that everyone can put their own little spin on the different sections based on their own pup's situation, diet, meds, etc. I'm always mucking around with things, trying to come up with different ways to do things that hopefully can make the process easier, more efficient, what have you. If there's anything else I can do, let me know. It's the least I could do given the amount of help and information I've received in a short time being here. thank you SO much... this is such a great idea. Again great idea and thank YOU!!!!!!!!!!!!!!!!!!!!!!!!!! Once again, THANK YOU Bill!!!! Ok, so for all of those who might be interested in the Log I put together, I did a quick screen grab video recording of the set up process from clicking the link above (or on the log page) to setting up any adjustments to setting up the google sheet where the responses are stored. I demonstrate how to get the url (web address) for the live form and how to go through and make an entry to the log. Finally I open up the google sheet and show how the spreadsheet appears with a response loaded. You can see from the video how I have both the log and the response form saved as a quick link on the bookmark toolbar so it is always readily accessible.